IN the News today, The Movie “Hangover Part 2″, Mike Tyson, and Tattoo copyright law. You may or may not know it, but Mike Tyson appears in the the Hangover movies. And making its reappearance is Mike Tyson’s unique facial tattoo designed by a St. Louis Tattoo artist…but it appears on actor Ed Helms’ face this time. The Tattoo artist is claiming copyright and infringement on that copyright. As an artist myself, I’ve very sensitive to freedom of speech, expression, and copyright issues. I’ve understood for a long time that everyday people get copyrighted art, characters, trademarks and identities tattoed on their bodies. In the case of a tattoo, you or the tattooist is taking copyrighted art and making an unauthorized copy or “derivative” of the original (such a s a sports team logo or Betty Boop). And this practice has gone on since the invention of the tattoo. So where does it end and who’s right? I’m guessing the judge may side for the artist and award him the huge chunk of cash he’s obviously after. But is the tattoo used as a PARODY? I create cartoons nearly every day where a parody of some sort is happening. I’ll take a current news event, company, or otherwise copyright protected object or personality and create a legal, lawful, non-infringing parody of that subject. Here’s the simple truth. Did they take the tattoo and reproduce it exactly for purposes of creating a parallel to Tyson’s tattoo? DId they take the tattoo and claim it was unique? Did they claim the original St. Louis artist also create this tattoo? If they answered YES to any of those questions, chances are it’s infringement. 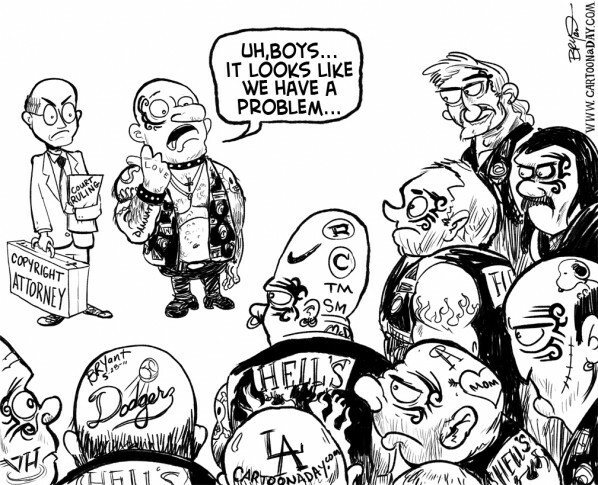 Inspiration: Daily cartoon featuring the subject of tattoo ownership and copyright. 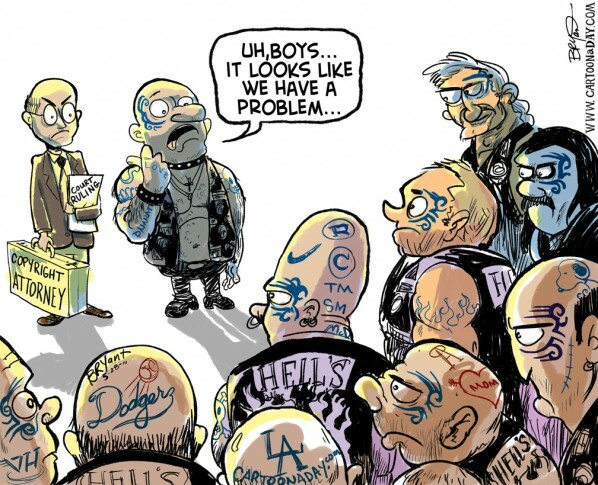 A Biker gang full of tattoos may be infringing on Mike Tyson's artist.